Update: HCL assured me that in the Domino 10 Gold release below issue will be fixed. If there’s no SSLCipherSpec line in the notes.ini, Domino will automatically select the strong ciphers. Just as in the Domino 9.0.1 with the later fixpacks. HCL is running a beta program for Domino V10. If you haven’t heard anything about Domino V10 yet and had any interest in Lotus/IBM Domino in the past, it might be about time to inform yourself as for the first time in 5 years, we actually get a new release of Domino and it will contain some features that are easy to get excited about. For more info on Domino V10, just Google though this blog article by Hogne Bo Petterson might be a good start. As I’m part of the Domino V10 beta program I’ll blog about it every now and then as I encounter things worth mentioning on the way. 04-09-2018 22:52:14.62 SSLDisableExportCiphers> Disabling weak cipher RSA_WITH_3DES_EDE_CBC_SHA. Set notes.ini "USE_WEAK_SSL_CIPHERS=1" to re-enable. 04-09-2018 22:52:14.62 SSLDisableExportCiphers> Disabling weak cipher RSA_WITH_RC4_128_SHA. Set notes.ini "USE_WEAK_SSL_CIPHERS=1" to re-enable. 04-09-2018 22:52:14.62 SSLDisableExportCiphers> Disabling weak cipher RSA_WITH_RC4_128_MD5. Set notes.ini "USE_WEAK_SSL_CIPHERS=1" to re-enable. 04-09-2018 22:52:14.62 SSLDisableExportCiphers> Disabling weak cipher RSA_WITH_DES_CBC_SHA. Set notes.ini "USE_WEAK_SSL_CIPHERS=1" to re-enable. required for Domino 9.0.1 feature packs is no longer required as of Domino 10.
notes.ini setting and cipher settings in Internet Site documents were ignored. after upgrading to Domino 10. So yes, remember those really old ciphers in your internet site documents? Suddenly they’re used again, which is why I got the messages about those really old ciphers (and they weren’t used in the end as USE_WEAK_SSL_CIPHERS=1 wasn’t in my notes.ini). 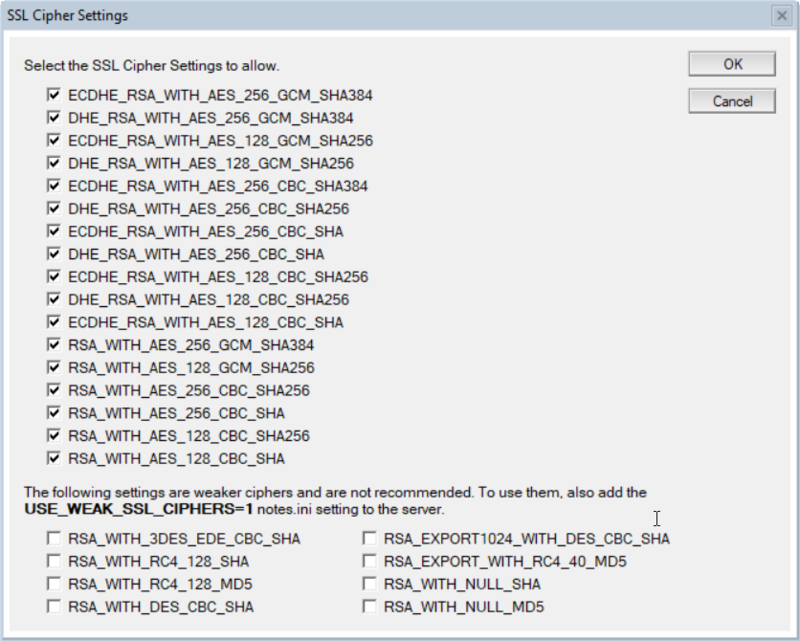 All the newer ciphers, which are the only ciphers which the connecting browsers, ldap clients etc use, are not selected by default. So the solution, once you know what’s happening, is easy. Go through all your internet site documents and select the ciphers you want to allow.